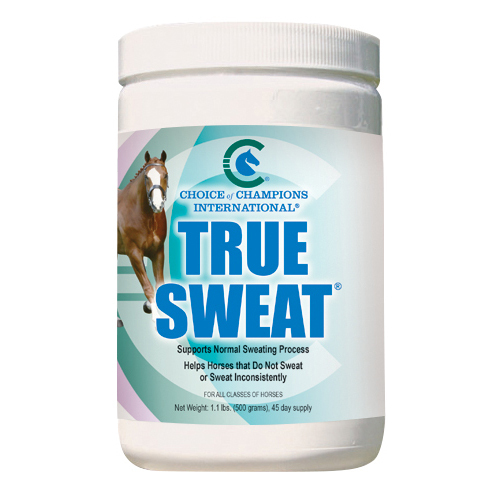 TRUE SWEAT helps horses that do not sweat or sweat inconsistently. TRUE SWEAT supports the normal sweating process and brain function and contains ingredients known to help maintain a healthy nervous system. Anhidrosis, the failure to sweat or insufficient sweat, reduces a horse’s ability to perform. Signs include not sweating at all, only small amounts of sweat under the bridle or saddle pad after riding, light sweat on the flanks, dull coat and heavy breathing during and after exercise. When a horse does not sweat properly, core temperature and essential enzyme-driven metabolic process cannot be properly maintained. Failure to sweat causes increased body temperature, acid in the stomach and general discomfort. Zinc Oxide – Zinc plays an important role in growth and development, immune response, neurological function and reproduction. Cholene Bitartrate – A lipotropic factor and precursor of Betaine. The kidneys use Choline Bitartrate to maintain water balance, critical for normal membrane structure and function. It is used to produce the neurotransmitter Acetylcholine. Inositol – A fundamental ingredient of cell membranes, necessary for proper function of nerves, brain and muscles. Serotonin, a neurotransmitter in the brain, requires inositol for proper functioning. Thiamine Mononitrate – Thiamine Mononitrate is essential for the function of the heart, muscles and nervous system. Niacin – One of the B vitamins required for cell respiration. Niacin helps support the metabolism. It promotes proper circulation and healthy skin, correct functioning of the nervous system, normal secretion of bile and stomach fluids. Pyridoxine HCl – One of the B vitamins necessary for metabolism. Pyridoxine HCl assists in the balancing of sodium and Potassium, essential components of sweat. d-Calcium Pantothenate – One of the B vitamins, a component of coenzyme A, a coenzyme for a variety of life-sustaining reactions. It is necessary for the synthesis of fats, steroid hormones and neurotransmitter acetylcholine. This unique combination of ingredients may be used under current USEF and FEI regulations. This supplement has been used in FEI competitions including the Pan American Games, FEI World Cup Finals, World Equestrian Games, Rolex Three-Day Event and the Olympics, as well as USEF competitions nationwide. It is the rider and the trainer’s responsibility to stay abreast of the rule changes for the USEF, FEI and other governing organizations.